Before I went vegan one of my favorite candy bars was a Reese’s Peanut Butter Cup. Every Halloween the PBCs that my kids hauled home after hours of begging and mayhem—I was on to them—mysteriously disappeared overnight. They never guessed that I was the culprit, because I was the food Nazi of the house, so it wouldn’t make sense that I’d loot from their stash. Boy did I have them fooled! 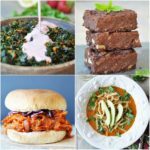 And here I am, a year and a half into my awesome vegan life, and there have been zero PBCs in my world. I went from eating healthy, to eating healthier, without even trying. That’s what a whole food plant-based diet will do for you. I hadn’t even thought about a PBC until I saw these. Michele’s peanut butter cups triggered a craving, and it wasn’t going away. So I made these no bake peanut butter cup energy bites. 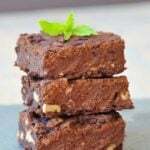 Michele’s two ingredient recipe inspired me to make an energy bite to share with my USTA tennis team this weekend. Our team won the district championship last weekend and we’re going to the State Championship this Saturday! This is seriously intense tennis. We play two matches with a half hour break in between. Most of us will play outside in the heat, and believe me, it’s draining. I play singles, and it’s brutal. This isn’t social tennis, we’re in it to win it! We’ll run down every ball that comes back to us. Some sets can go for three hours or more! 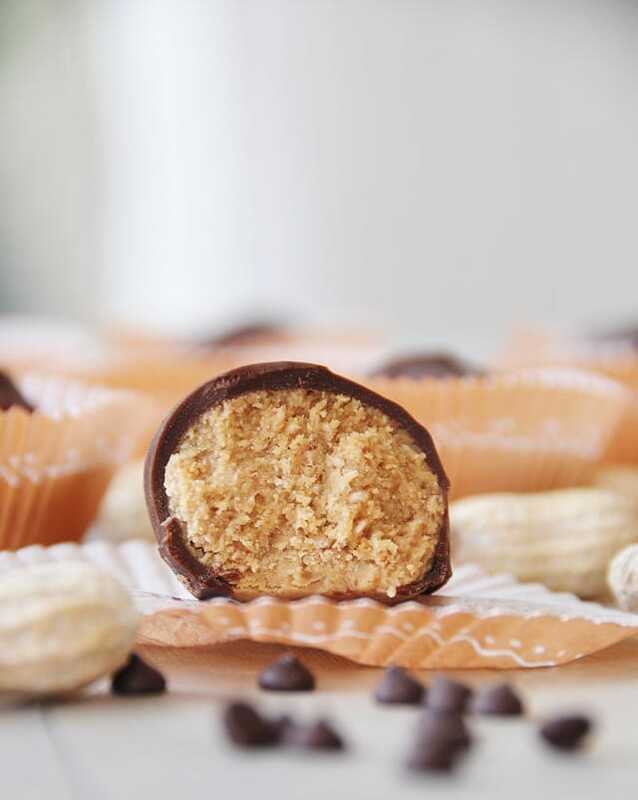 That’s why we need food that will fuel and re-fuel, like these peanut butter cup energy bites. It took me a couple of tries to get the filling just right. The first round was too creamy and sticky. Imagine watching a dog eat a spoonful of peanut butter, you get the picture. A dog looks cute eating PB, me, not so much. I added more ground oats to the second batch and it was much better. 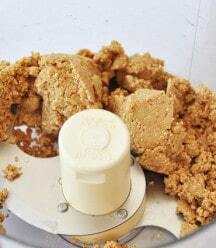 The ground oats and flax seed make the natural peanut butter less wet, so it’s easier to eat. No tongue lapping on the roof of your mouth. 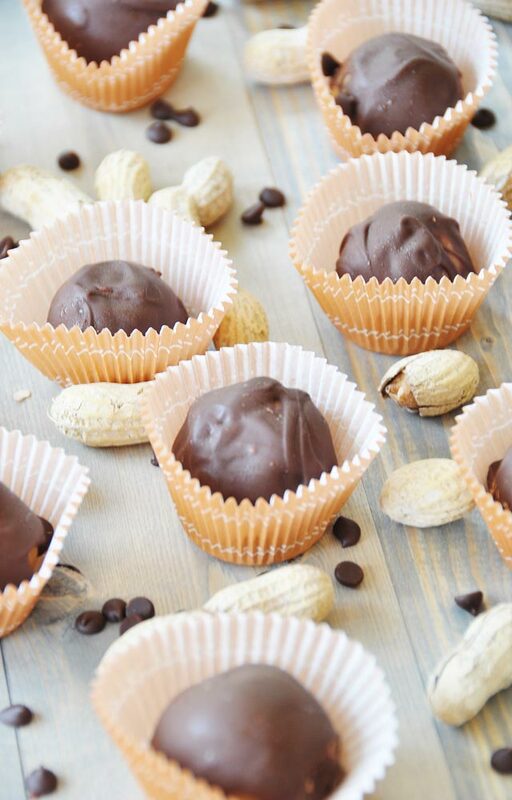 These peanut butter and chocolate bites are seriously the best of all worlds. You feel like you’re eating candy, and in a sense, you are. 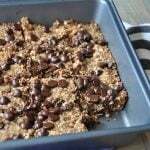 But this is a good for you candy, because it has oat flour, flax seed, and dates. Why is that so good? Let’s break it down. As you can see, these little bites are big energy bombs. 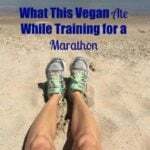 When you’re sprinting, making sudden stops, lunging, reaching, and continuously moving, your body is going to need something to get it back to top gear quickly. Exhausted muscles need potassium or they’re going to start cramping, and there are only so many bananas that you can eat, and those sports drinks that are filled with artificial colors and flavors, just don’t. 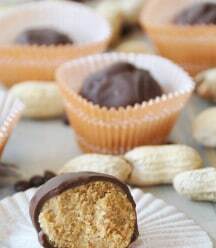 My no bake peanut butter energy bites are healthy. You can replace so many vital nutrients with just a couple of these. And they’re so much tastier than a sugary and salty neon beverage. 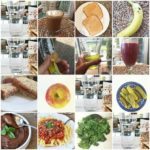 Drink water, eat these, and feel good! Wish me and my awesome team luck this Saturday. If we win State we move on to the Regional Championship round, and if we win that, we’ll be heading to Indian Wells, CA in October for the National Championship! You have no idea how much I want this. Fingers crossed! 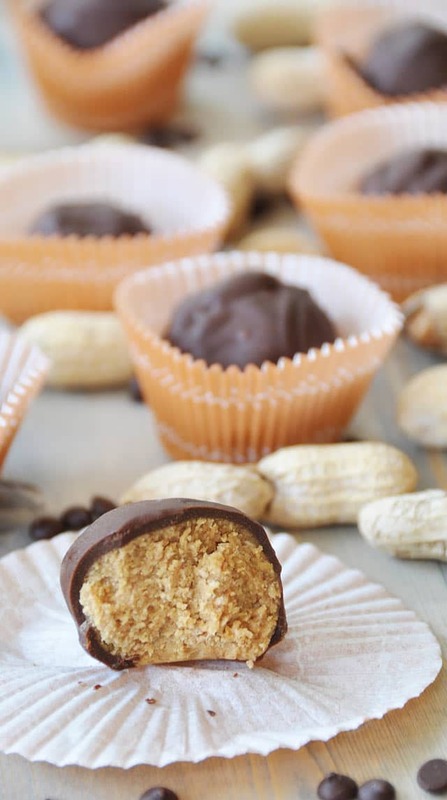 No bake peanut butter cups filled with nutritious ingredients that will give you energy. 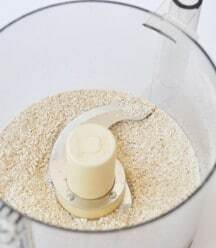 Grind the oats in a food processor until it resembles flour. Add the flax seed and process until blended. Add the peanut butter, dates, and sea salt and process until it forms a ball. 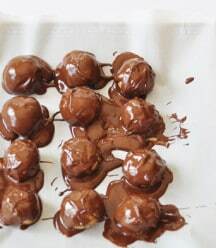 Melt the chocolate chips until the chocolate is thin and pourable. 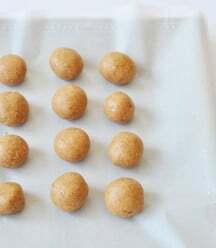 Roll the dough into one inch balls and cover with the chocolate. Freeze for thirty minutes. 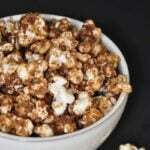 Keep refrigerated in an airtight container for up to one week.